We've got another MTK Android Device by Micromax! 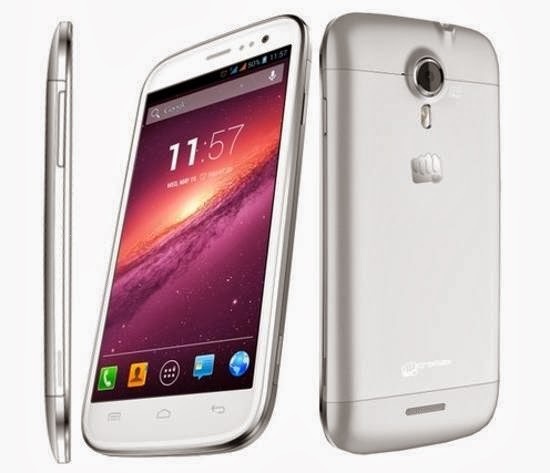 Micromax recently announced the Micromax A117 Mangus. The device belong to Canvas series so we can compare it with other Canvases. I think the device is successor of Canvas HD or any other device [Canvas 2 Plus etc.]. The Mangus is a decent device with excellent features at good price. You get MT6589T Chipset clocked at 1.5 GHz with a Quad Core processor, 5 Inch HD display with 1280x720p resolution, Android 4.2 Jelly Bean, 1 GB RAM, 4 GB Internal Storage, 12 Mega Pixels camera capable to record full HD videos and 2 Mega Pixels front camera at just 13,229 Rs. That's quite less for a device with Quad Core processor and 1 GB RAM as compared to the devices of Karbonn, Canvas HD, Celkon, Lava Iris, XOLO etc. The device chipset is MT6589T, as same as Micromax A89, Canvas 2, Canvas Turbo etc so we can easily root it by Famaroot application. Move it to your SD card. Install it like other applications. Select SuperSU and click Boromir. You will see a message displaying that it is now rooted. You can check that if it is rooted or not by applications like Root Checker. Don't have Canvas Magnus? The great device is cheap and also having great specifications! You can buy this device from FlipKart at cheap rate!